Offering the very best in contemporary indoor-outdoor living, a keyed elevator opens directly into this luxurious, full-floor penthouse treasure boasting more than 2,470 square feet +/- across 3 bedrooms and 2.5 baths. This stunning loft features two large private outdoor terraces spanning more than 1,515 square feet +/- and a Two Car Private Garage with plenty of room for additional storage.The immaculate, oversized living, dining and kitchen area are flooded in natural light through floor-to-ceiling windows and boast soaring approx. 13 +/- high ceilings. The stunning gourmet kitchen features integrated custom Italian cabinetry, Bosch appliances, and a Sub-Zero refrigerator. Perfect for entertaining, the open living area connects to a sprawling outdoor terrace through sliding glass doors offering breathtaking Brooklyn Bridge and city skyline views. The master suite, which includes a large walk-in closet, is flooded in sunlight through floor-to-ceiling sliding glass doors that lead to a separate terrace offering the perfect private outdoor oasis. The en suite master bath features a dual vanity and stunning rain shower with dual shower heads and freestanding deep soaking tub. The second and third generously-sized bedrooms include a shared full-sized bath with dual vanity and tub. One of the two bedrooms includes sliding glass doors that lead onto the primary terrace connected to the living room. 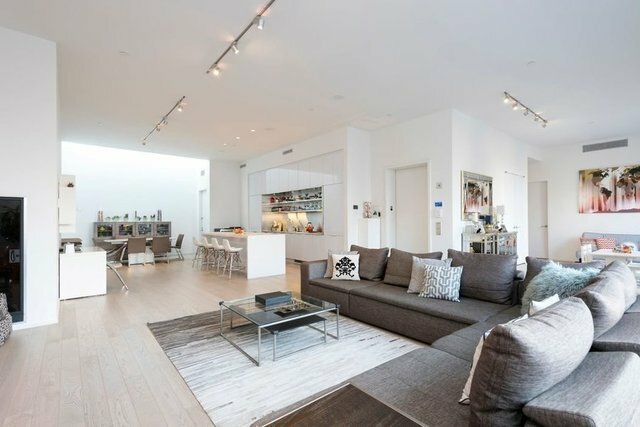 Converted from a warehouse into eight expansive lofts in 2010, 192 Water Street maintains the historic architectural character of its time while beautifully integrating modern upgrades and finishes throughout. 192 Water Street offers a virtual doorman, gym, and storage and is surrounded by coveted restaurants, shopping, parks, and all that DUMBO has to offer.